It's been two years since Apple launched its radically redesigned Mac Pro, but the professional-level workstation has not seen any updates since that time despite the availability of upgraded versions of many of the components used in the machine. We may be getting closer to an update, however, as Pike's Universum has discovered a reference to a new Mac code name of "AAPLJ951" within OS X El Capitan. The identity of the Mac corresponding to that code name is not explicitly revealed in OS X, but Pike points to the similar AAPLJ90 code name for the current Mac Pro as a reason to believe this new machine is a Mac Pro. 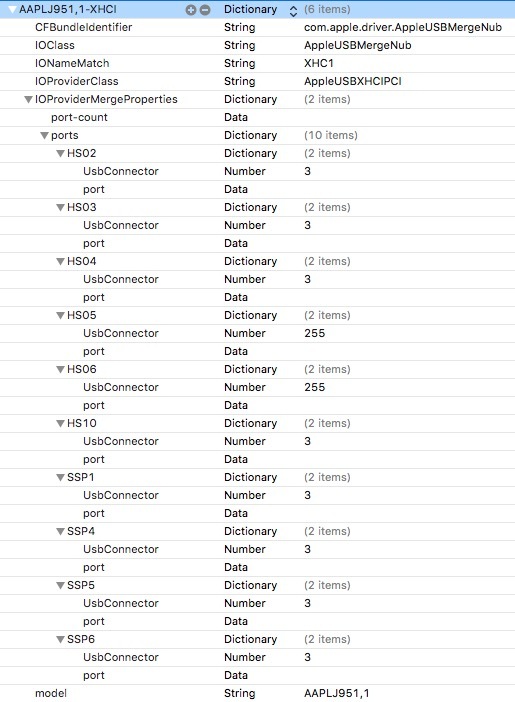 The data is identical to that of the late 2015 (iMac17,1 in the same file) so it may as well be a remnant of the new iMac, but the strange thing is that the XHCI data for the late 2015 iMac is also there, which is why I believe that this is not/was not added for the/a new iMac but another Mac. And like I said earlier in the comments, there are too many USB 3 ports defined to fit on a MacBook (Pro) and Mac Mini. This and the fact that there is already support for newer graphics chips [baked] into El Capitan… is why I think that it was added for a new Mac Pro. I personally sure hope so. Looking toward possible specs for the next Mac Pro, it seems likely it will run on Xeon-branded Broadwell EP chips and include significantly faster graphics based on AMD's Fury platform, along with faster memory and storage and perhaps Thunderbolt 3 connectivity involving a partial shift to USB-C connectivity. I don't understand why they don't do it. Where is the non mini non pro and non imac option? Where is the pc equivalent that would go into offices and homes? I am not going to buy another imac, not going to buy the mac pro, hell no and the mini is underpowered. The whole mac strategy in 2015 is complete BS. So much so that I started making a pc for my audio stuff and it's just so frustrating. Apple gimps everything by controlling the levels of what is offered for a price, then the upgrade costs x + apple tax. I really hope there is more of a backlash soon, I'm getting sick of this. Can't be the only one. Lots of people have money for you apple, they love the OS, don't strangle the **** out of your customers. I just really hope they drop the trashcan design for something with a little more expandability. Would love a new Mac, but refuse to buy something I need to plug external hard drives all over to expand. Or, instead of all that upgrades for MP 2013, for the same money, you buy a house. It's good to have any Mac Pro rumors at all. The Mac Pro that you keep on pining over is NOT that expandable -- in fact the Mac Pro 2013 is much more expandable. That's an awfully misleading statement. The new MP is "more expandable" in your very cherry-picked scenario of Thunderbolt-attached devices. In almost every other way it is less expandable. Fewer CPU sockets, fewer memory sockets, no optical bays, no HDD bays, no PCIe slots, and extremely restrictive GPU choices. And if the new MP had simply kept the same physical design as the classic MP, it would have had all of those advantages plus Thunderbolt attached devices. There are several advantages to the new MP design. It is smaller in size, uses less power, makes less noise, and has fewer fans that can fail. But "much more expandable"? No, not without some narrowly defined view of expansion, and even that falls apart compared to what a 2013 MP could have been if they hadn't changed the basic physical design. The design is not bad... it's a space saver and a conversation piece too. The design really does make sense over something that's going to be bulky and take up 3-4x's the space when not needed. the OLD mac Mini, yes. Essentially, the new Mac Mini's would cost more, to get less power than what I was currently using at the time. OSx isn't a concern to me because the platform that I use doesn't have OSx compatibility anyways as my overall need is linux/unix. I envy you. I fell in love with OS X the minute I laid eyes on her. With Apple's trend of reducing performance and upgradability while increasing prices, I start to wonder if I'm suffering some kind of Stockholm Syndrome. Why am I still here? I know they've moved on to the younger, sexier, hipper consumer electronics segment. But I keep thinking maybe they'll come back to their roots. Remember the good old days. Or maybe it would occur to them they could have one machine that emphasized function over form, you know just to see how it goes. But no, I leave the light on, night after night, while Johnny Ives "Live Photos" his flaccid junk to adoring fans on another iOS bender. While I cry in my server room clutching our cheese grater Mac Pros that we used to cherish together. Mac Pro: The world's most advanced bathroom trash can. Above: The worlds most overused unfunny comment.